There's no description more apt for Sheryl Bailey than "A sizzling guitar goddess", coined by Elliot Simon of All About Jazz. He's not alone with his superlatives-Adam Levy of Guitar Player Magazine calls Sheryl "One of the most compelling tones of her generation", and Frank Forte of Just Jazz Guitar ranks her "among the best bop guitar players with a fresh approach and something new." Sheryl's playing is unquestionably "sizzling". She has groomed incredible chops and impeccable taste with which she applies them. It's said (by Lee Metcalf, The Villager) that she can "go from zero to blazing in two beats", but she is continually praised for never sacrificing melody and lyricism for technique. "She balances superior technical skills with a strong lyrical sense and swinging touch..." continues Metcalf, and Joe Taylor of Soundstage says "Bailey combines an astonishing command of the fingerboard with a seemingly endless flow of melodic invention." As for the guitar, she's hardly had it out of her hands since the age of 13. That was when her mother finally relented to Sheryl's begging for a Harmony Strat from the J.C. Penney catalogue. Though Sheryl was a rock-star wannabe, the influence of her pianist mother got her obsessed with learning harmony, and her first teacher in Pittsburgh, John Maione, introduced her to the guitar tradition-Wes, Jimmy Raney, George Van Eps, Joe Pass and others. She eventually attended Berklee College of Music. Her years of dedication and focus won her 3rd place in the Thelonius Monk International Jazz Guitar competition in 1995, and she was chosen as a Jazz Ambassador for the U.S. State Department in 2000 for a South American tour. She is now said to be "One of the top players in an emerging generation of jazz guitarists" (John Heidt, Vintage Guitar). Her own trio, The Sheryl Bailey 3, is a modernized version of the organ trio-"the ultimate organ trio" according to JazzInside Magazine. In addition to their 15-year plus residency at NYC's 55 Bar, they have toured China, Canada, Europe and the US. She also tours the world as a member of David Krakauer's "Ancestral Groove". A partial list of others with whom she has performed and recorded with includes Richard Bona, George Garzone, Lincoln Goines, Kim Plainfield, Bill O'Connell, Mike LeDonne, Irene Cara, Lea Delaria, Jack Wilkins, Howard Alden, Shingo Okudaira, Ingrid Jensen, Dwayne Burno, Tommy Campbell, Simon Woolf, Alex Garnett and Ken Peplowski. To date, Sheryl has 9 CDs out under her name, and a live DVD, The Sheryl Bailey 3 Live in NYC (Mel Bay). Each successive release has drawn more accolades. Of Live at the Fat Cat, Joe Taylor says, "...this disc proves again that Sheryl Bailey is one of the most gifted and exciting jazz guitarists on the scene", and that she is a "jazz composer of the first order". 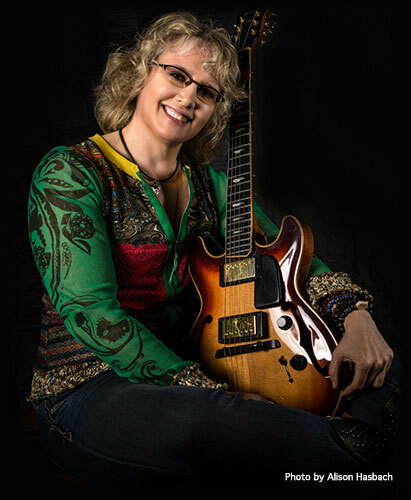 In 2010 MCG Jazz released A New Promise, her tribute to Emily Remler, produced by Grammy-award winner, Marty Ashby, featuring Sheryl as the solo artist with Three Rivers Jazz Orchestra. In Downbeat Magazine Phillip Booth commented, "She is one of the new greats of her chosen instrument". Her 2014 release on the Cellar Live label, A Meeting Of Minds features The Sheryl Bailey 3. A feature on the disc in Guitar Player Magazine states: "They are so in sync they seem to finish each other's ideas". In 2015, she and bassist Harvie S debuted their acoustic duo, Plucky Strum on Whaling City Sound. JazzTimes Magazine remarked of Bailey’s approach: "her fluidity of style is impressive, her agility uncommon". Sheryl is a Professor at Berklee College of Music, and at the Collective in New York. In keeping with Sheryl's philosophy of "giving back", her 2011 quartet release, "For All Those Living" donates 20% of sales to the Ronald McDonald House of NYC. She has been an Artist in Residence at countless other programs, including NYU, Bates College, the Stanford Jazz Workshop, Towson University, the LA Music Academy and GIT. In 2009, Mel Bay published her book Moveable Shapes: Concepts for Re-Harmonizing II-V-I's. She has also developed a complete curriculum in jazz improvisation for interactive cyber study via Truefire's Guitar Sherpa program, The Bebop Dojo. In addition she has top selling courses available from Mike's Masterclasses, Jazz Guitar Society, JamPlay, and Truefire. So, Sheryl lives up to Elliot Simon's description, in all facets of her work. Earning "Rising Star" status on Downbeat's Critic's Poll 2013, 2014, and 2015. At a recent duo performance in New York-Sheryl and Jack Wilkins-I sat next to Jimmy Wyble. After a couple of tunes, Jimmy leaned over and whispered, "She's one of the top five" ...as in, one of the top five guitarists in the country. And Vintage Guitar terms her "one of jazz guitars current front runners."